The 38th season of Seahawks football kicks off Sunday as the Seahawks head to Charlotte to take on the Carolina Panthers. Seattle leads the all-time series against Carolina 4-2. These two teams last met last October. Thanks to an errant pass by Cam Newton on 4th and goal, the Seahawks escaped with a 16-12 victory to improve their record to 3-2. It is very important for the Seahawks, this season more than any other, to take each game one at a time. We cannot afford to start slow like against Arizona last season because these early season games could come back to cost you big time at the end of the season heading into the playoffs. Here are some keys to this week’s game. Given the handful of injuries and Bruce Irvin’s four-game suspension, I am most interested to see what our starting defensive unit looks like this week. Specifically, I am curious to know who will start at the “Leo” defensive end position. Chris Clemons has been ruled out by Coach Pete Carroll this week. Cliff Avril has been nursing a hamstring injury but he has been practicing this week. His status for Sunday’s game is still up in the air. 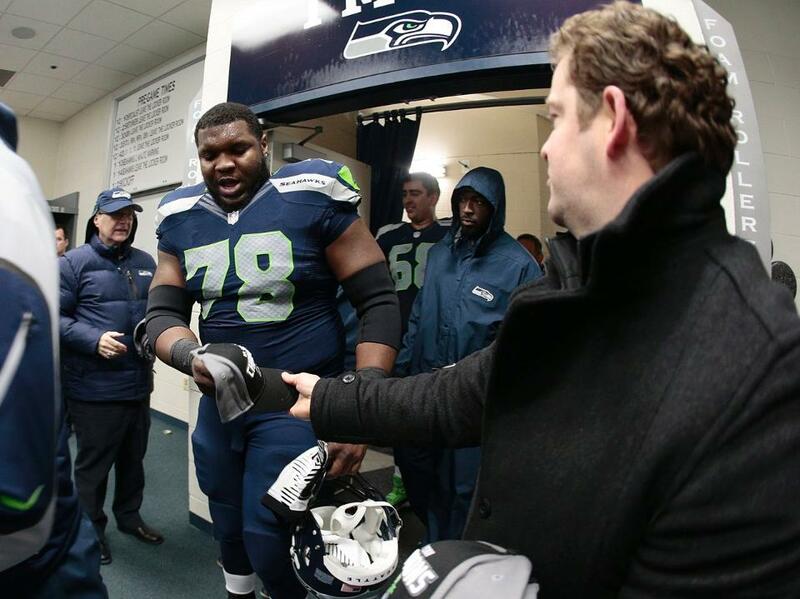 Michael Bennett is also nursing an injury to his toe. 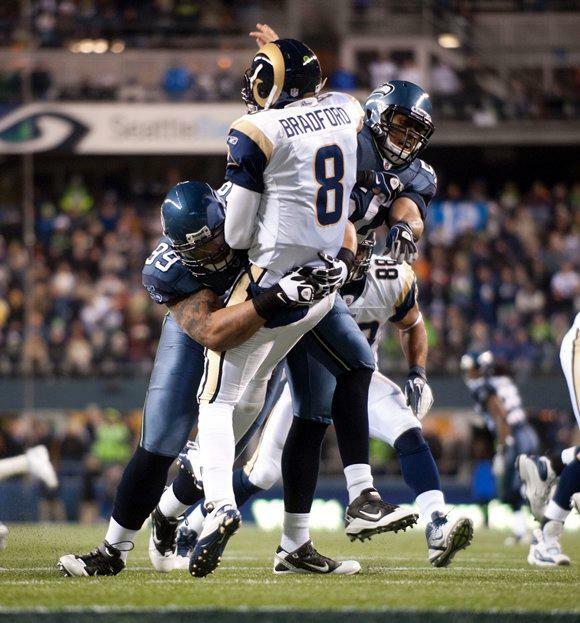 I expect Bennett to play this week but he will see snaps at defensive tackle for most of the game. If Avril is unable to play, the starting defensive end will be O’Brien Schofield. I would be more comfortable having Schofield start over rookie Benson Mayowa simply because he has prior starting experience. He started at outside linebacker on a good Arizona Cardinals defense last season. I am not sure if Mayowa is ready to be thrown into the starting rotation. Mayowa would be best used exclusively on passing downs. I believe using Mayowa at defensive end and Schofield at outside linebacker on third down would be the best pass rushing option if Avril is unavailable. If Avril is available, our third down pass rush package could consist of Mayowa on the other side of the line with Schofield at outside linebacker. The number one key for the Seahawks offense this week is avoiding a slow start. Last season when we opened up the season at Arizona, many including myself believed that we could handle the Cardinals easily which would entail jumping out to a strong, early lead. Instead the Seahawks scored only 3 points in the first half and lost the game after scoring only 16 total points. Avoiding a slow start in essence means limiting the Panthers to build any kind of momentum. If the Seahawks can score a minimum of 14 points in the first half, I will consider us to be in good shape. A sub-key to achieving this goal will be to control the tempo of the game and win the time of possession battle. In a week one situation, you do not want to give Cam Newton and the Panthers offense time to move the ball. If Russell Wilson and Marshawn Lynch can be effective in the run game, it bodes well for the Seahawks to control the time of possession battle and to jump out to an early lead. 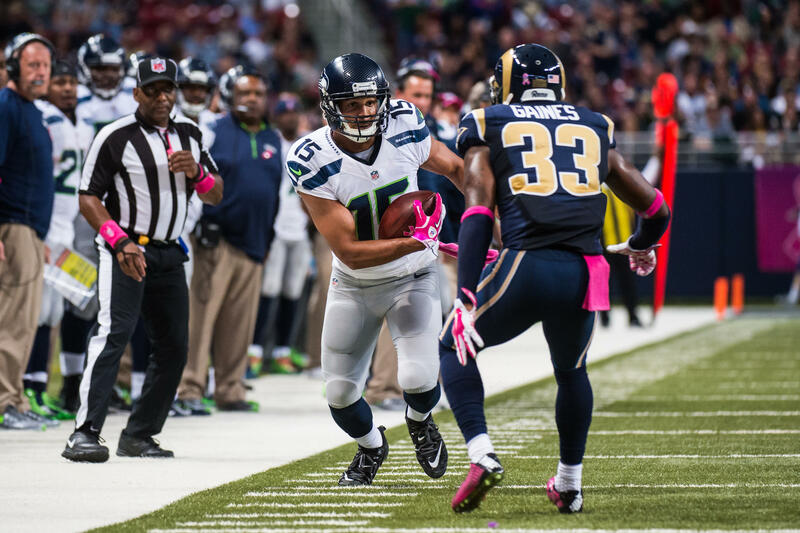 One more thing to keep an eye out for this week is Jermaine Kearse on special teams. It was announced on Monday that Jermaine Kearse would get the first crack at filling Leon Washington’s shoes as the Seahawks kick returner. Kearse’s one kick return in the preseason was returned for a touchdown. That one kickoff return earned him the chance to be the Seahawks kick returner to start the regular season. I am interested to see what the rotation will be if Kearse struggles. 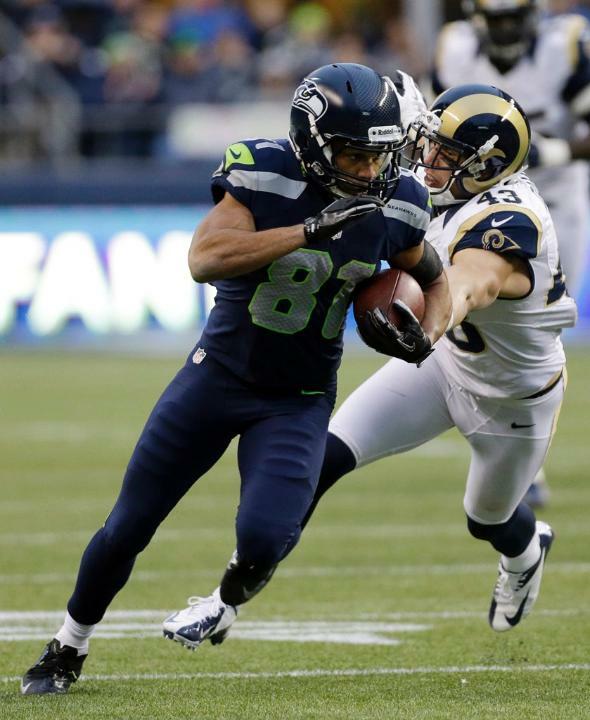 I would not be surprised to see Golden Tate to get the next chance at returning kicks. Tate will return punts on Sunday. Like last year against the Panthers, the player that the Seahawks defense should be most worried about is quarterback Cam Newton. I predicted a Seahawks loss in Carolina last season, based on the notion that I thought Cam Newton was going to go off, throwing for multiple touchdowns and rushing for a significant amount of yards. Although Newton did not play well last season, especially against the Seahawks, the potential remains there for him to break out at any time. If we were scheduled to play the Carolina Panthers later in the season, I would probably feel more confident in the Seahawks being able to beat them. In week one however, any outcome is possible regardless of who you we playing and where we are playing. The Seahawks defense must use their speed to slow Newton down and limit his running lanes if he is forced out of the pocket. If we are successful in taking Newton’s feet away we will definitely have a better chance to win. I am not expecting much out of our pass rush this week but if Newton can buy time and is going to scramble, the movement of our linebackers and secondary, not the defensive line, will be the key to our defense this week. The Carolina Panthers have a very young, yet talented defense. Each level has one player that cannot go unnoticed this week. Along the defensive line is rookie Star Lotulelei. Star, the cousin of Seahawks linebacker John Lotulelei, was Carolina’s first round pick in the 2013 NFL Draft. Lotulelei showed a lot of physicality during the preseason and beat out former Seahawk Colin Cole and fellow rookie Kawann Short for the second defensive tackle job. Lotulelei will be effective in stuffing the run if he can beat the man across from him. I expect the Panthers to line Lotulelei up against right guard J.R. Sweezy. In the second level the Panthers boast the 2012 defensive rookie of the year, middle linebacker Luke Kuechly. Kuechly led the Panthers in tackles last year and he does a great job of getting to the play. I am looking to see how Kuechly handles the zone-read option. The Seahawks had not installed the zone-read option when these two teams played last season. If the Seahawks are effective in fooling Kuechly, it will bode well for us extending our drives and scoring points. The man to watch in Carolina’s secondary is cornerback Josh Thomas. Thomas lost his starting job in the middle of last season and with the release of veteran Drayton Florence at the end of the preseason, Thomas earned his starting job back for the start of this season. Expect Sidney Rice to line up against Thomas this week and I believe Russell Wilson will try to test Thomas early and often by throwing to Rice in the first half. One of the things I felt was crucial during the playoffs last season was the Seahawks mindset that every game was a win-or-go-home playoff situation. I think it would benefit us tremendously if we come out and show the same sense of urgency against the Panthers. If we put playoff level effort and show playoff level urgency in every regular season game, we will be better off in the long run. Random Thoughts: The Seahawks will wear blue jerseys this week. With a game time temperature expected to be in the high 80’s or low 90’s, the Seahawks will most likely wear either white pants or grey pants this week. The Seahawks wore the blue jersey/grey pants combo in Carolina last season… Chris Myers and Tim Ryan have the call for FOX this week. Sigh… Jeff Triplette is this week’s referee… This is the only game I’ll be watching from home in the first month of the season… I don’t like these 10am kickoffs. But it is the first week of the season so my adrenaline will be flowing all day Sunday… 2 games on NFL Red Zone in the afternoon: Packers/49ers and Cardinals/Rams. I get to watch and keep track of the entire NFC West this week and I’m pretty pumped about that… If anyone is interested in my television routine on a gameday where the Seahawks play on the road, here it is: NFL GameDay Morning on NFL Network from 6am-8am, ESPN Fantasy Now on ESPN2 from 8am-9am, FOX NFL Sunday from 9am-10am, the Seahawks game from 10am-1pm, NFL Red Zone from 1pm-4:30pm (the Seahawks game and Red Zone are flipped when the Seahawks play at 1pm), Football Night in America on NBC from 4:30pm-5:30pm, and Sunday Night Football following… Call me a fan or call me a fanatic… If the Seahawks lose and the 49ers win I am going to be pissed. 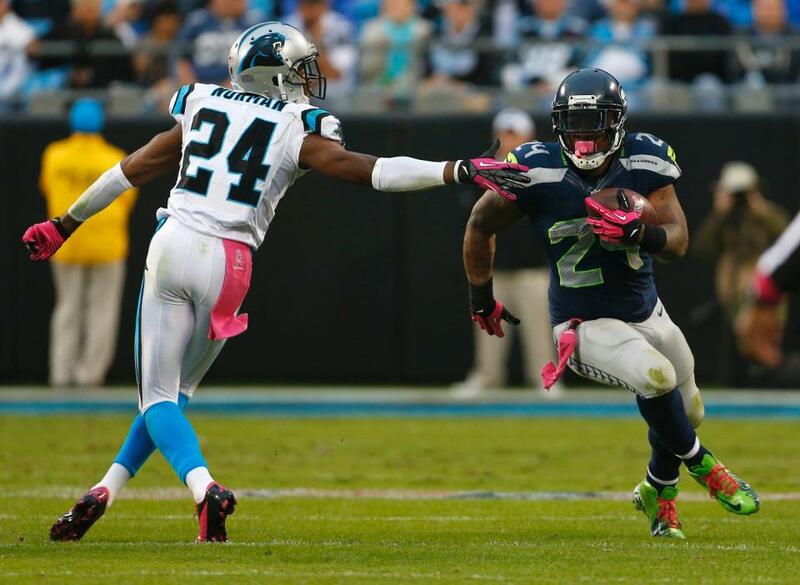 Prediction: A lot of my friends believe the Seahawks are going to blow out the Panthers. I think we will win but it will be a very close game. The Seahawks and Panthers will both get off to slow starts in the first half but the Seahawks ability to wear down the Panthers defense with long drives will be the difference. The Seahawks will score touchdowns; the Panthers will kick field goals. The Seahawks will head home 1-0 and will start preparation for a huge game against the San Francisco 49ers. Check back on Monday for my review of the Panthers game. Enjoy the weekend everybody. Welcome back football! Go Seahawks!